Grace and Truth Books is an on-line Christian bookstore committed to providing wholesome and pure literature for all ages. This company is not concerned with gimmicks other companies offer, or even the latest social trends. Their commit is to share the word of God and help others to know Him. 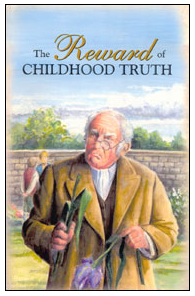 I received two books from Grace & Truth Books for this review: The Little Medicine Carrier and The Reward of Childhood Truth. Both books are intended for ages 8 to 12 and offer a wonderful testament to children about the importance of honesty, faithfulness, and being accountable for one's actions. The characters in the books are appealing and keep the storyline interesting and active for young readers. HOW DID WE USE THESE BOOKS? James has regular reading time each day, and he read these instead of his regular curriculum items. I really liked how eager he was to read them, and how he would return to read them even when it wasn't required. He was really moved by one story in particular (Mary's First and Last Falsehood), and it offered him and I a nice opportunity for a heart to heart chat. He is a "by the books" kind of kid, and I could tell that he was really struck by the consequences of being dishonest and not following the rules. I thought these books were nice because they had little lessons in the stories and the lesson would help you to know why it was a good thing to do things like tell the truth all the time. 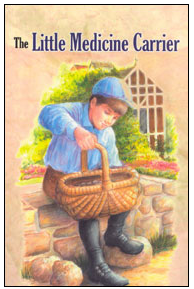 The Little Medicine Carrier and The Reward of Childhood Truth are both available on the Grace & Truth website for $4.75 each. Talk about a great price and the perfect stocking stuffer. In addition to these books, Grace & Truth Books offer books on homemaking, theology, education, and even carry titles in Spanish. Member of The Schoolhouse Review Crew checked out many different titles from Grace & Truth Books. Click here to read their reviews, or click the banner below. Disclaimer: As a member of The Schoolhouse Review Crew I received the above-named products free of charge in exchange for an honest review on this blog. I received no other compensation.